Hi everyone! 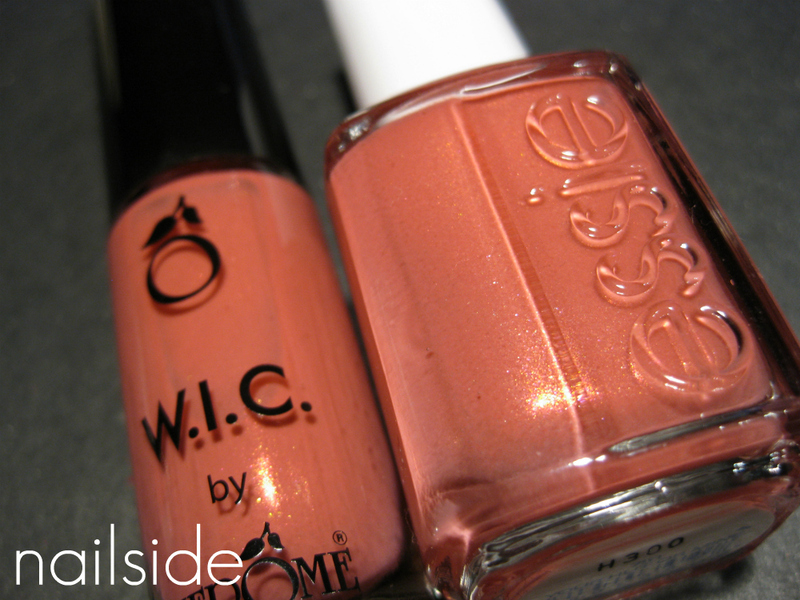 For this post I have some polishes from W.I.C. by Herôme to share with you. Herôme is a Dutch nail and hand care brand, they first started selling mainly treatment products but now also have a big, colorful nail polish collection named W.I.C. 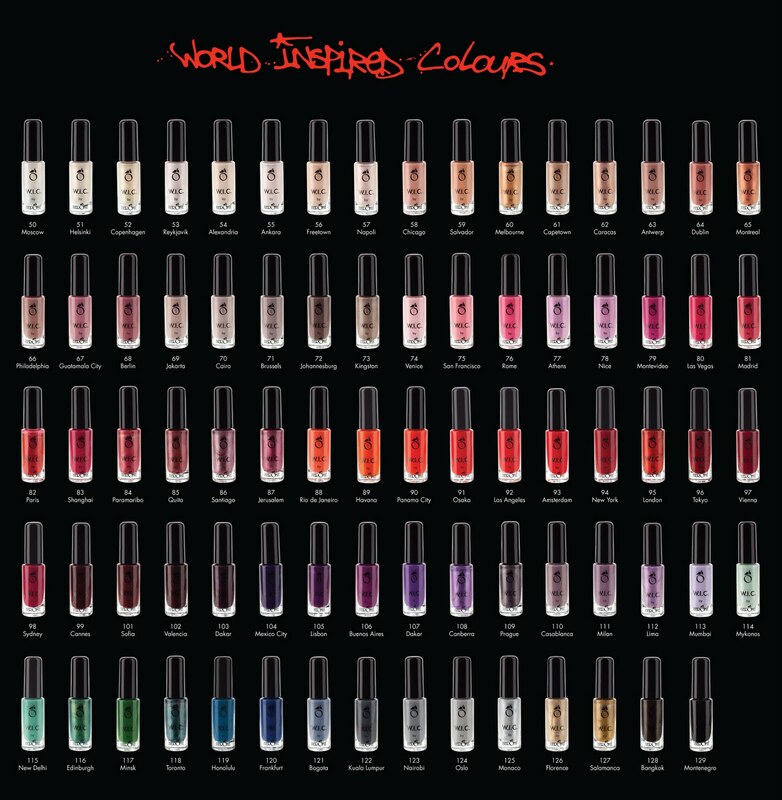 (World Inspired Colours). Each polish is inspired by and named after a big city. I'm a very, VERY lucky girl for having the entire W.I.C. core collection that I won in a nail art contest, but in addition to that Herôme has kindly sent me four new polishes from their latest limited collections from which I'm going to show you the first two today. From left to right: Aspen, Hollywood, Roskilde and Frederiksberg. This pretty from the Denmark collection is called Roskilde. Roskilde is a corally pink creme with a subtle pink shimmer. Because the pink is red-toned, it's a lovely warm color which actually suits my skintone, unlike many other soft pink shades. I know it looks pretty much just coral in the pictures, but that's because my camera just won't capture the pink tones in colors like this. The formula was excellent, like I'm used to from their other cremes, and the application was easy with the flat brush. So a great polish I'd say, although it's not unique. The first time I had Roskilde in my hands, it immediately reminded me of Essie Your Hut Or Mine which I also have. They looked so identical in the bottles that I didn't bother to compare swatches. They both have the same color and amount of the pink shimmer. And both need two coats to cover. Although I absolutely prefer Roskilde over Your Hut Or Mine appliaction-wise, since the latter tends to leave bald spots on me with the second coat. All in all I think both polishes are nice to have, Roskilde in particular, though you won't need them if you've got something similar in your stash. What's your thought on these polishes? W.I.C. nail polishes are available in the Herôme online shop for €7.50 per bottle of 0.7ml/0.2 fl.oz., or €12.50 for two. Shipping is worldwide. The products in this post were sent to me for review. This does not influence my opinion on the reviewed product. These are really pretty!!! :D Me likey! Very pretty! Your nails are perfect! those are very nice colors. I had never heard of herome before! Roskilde is such a pretty color!! I love that shade of coral it's quite subtle compared to most I've come across and very in keeping with the SS12 pastel trend. I've never heard of this brand but I will definitely get looking into them! At first sight, it didn´t appeal to me, as a polish, I would like on my nails. But the more I look at the colour, the more I like it. With Hollywood on the top it looks cute. Wow, the complete W.I.C. collection? That's what, 72 polishes? Awesome! I love this on you too. Omg.. roskilde looks awesome, i dont naturally buy corally pink color polish but ur swatch makes me want to have one. >.< anyways, im glad essie have somewhat of a similar color. Gonna try and get tht since herome is pretty impossible to get here. Thanks for the awesome swatch! !